One of the rituals that tells me spring is here is the opening of my front porch. As soon as we start getting warmer days, I clean it out, open the windows for some fresh air and Mr Q and I start spending evenings out there. The Adirondack is his, the wicker chaise is mine. I catch up on magazines, or both of us just read. I may consume a fair amount of wine out here too. 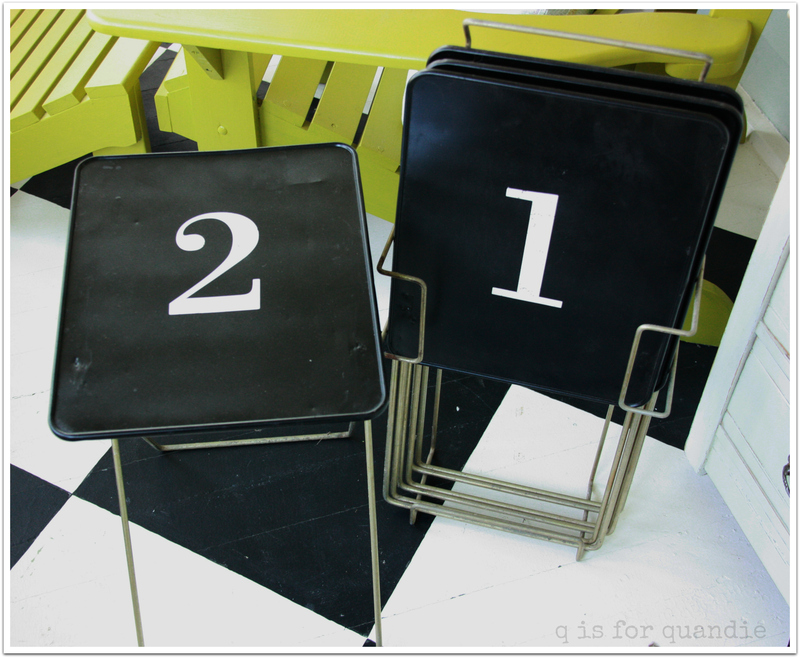 There used to be a matching wicker chair for Mr. Q, but you know I have given up matching furniture. Plus, he wanted the Adirondack because it’s really quite comfortable. I have a pair of them, the other one is outside. Ken, a.k.a. handyman extraordinaire, made them. Just to explain how skilled he is, he just took an old Adirondack chair and used it to make a template for building more chairs. He then made quite a few of these, I did sell several at my occasional sales. Nearly everything else on the front porch is a garage sale find. One of my favorite finds is the glass globe on the ceiling light. 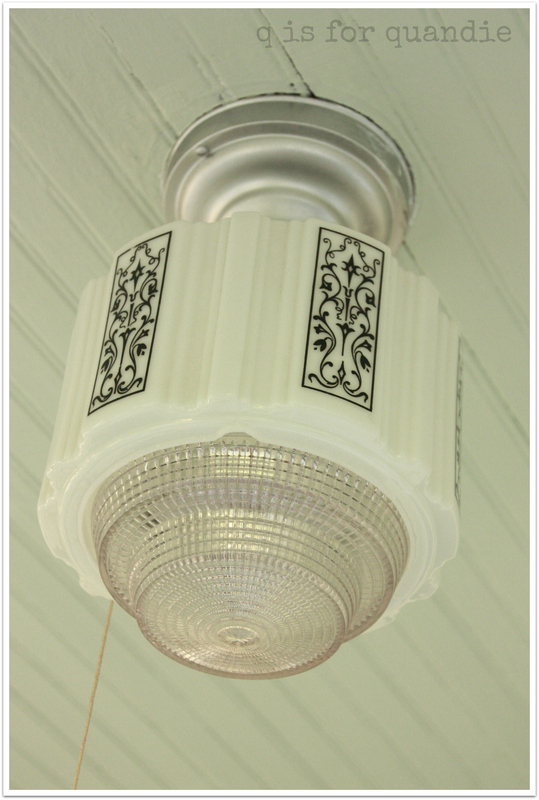 When we moved into our house there weren’t very many original light fixtures left (my house was built in 1904). The one on the front porch was fab though. It had that vintage schoolhouse look. But it got broken in an unfortunate mishap with an extension cord, don’t ask me how, I wasn’t there. Anyway, a while back I found this globe at a garage sale. I think I paid $12 for it. I knew it was a gamble because it might have ended up not fitting the fixture, but it worked like a charm. The light is just outside the door into the house. The cabinet on the end came from a garage sale. This was one of my earliest furniture rehab projects, from back in the day when I painted pretty much everything white. I recently repainted the inside aqua. It used to be pink. This summer I plan to change it up with something different in the ovals panels on the sides. I decoupaged them with map paper, but it has faded badly. Not sure what I will do instead. 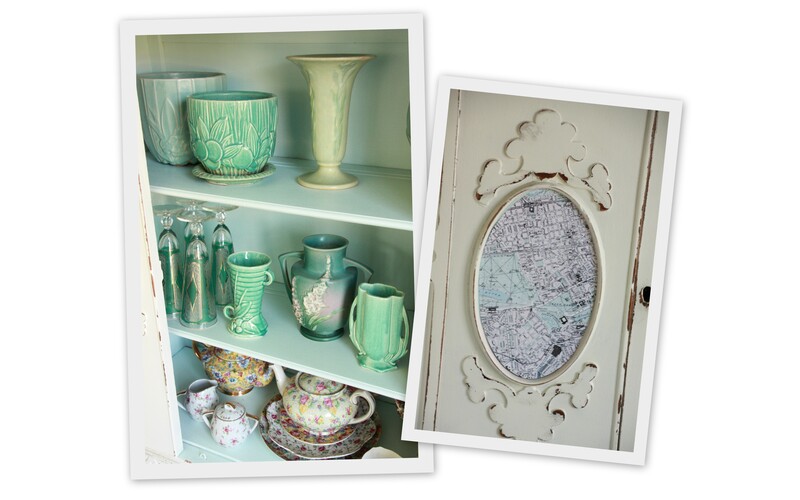 I have some of my aqua pottery and chintzware inside, plus some lovely vintage aqua glasses. To be honest, I ultimately wouldn’t mind switching this entire cabinet up for something else. When I come across just the right thing, I think I’ll know it. Just next to the door is this oak washstand which was a craigslist find. I’d like to repaint this with Miss Mustard Seed sometime this summer. We’ll see if I get around to it. The New Orleans watercolor hanging above it has always been a favorite of mine. This set of small TV trays was another garage sale find. I can’t even remember what color they were originally, but I painted them black and numbered them. I originally planned to put them in my Carriage House Sale, but they are so darn useful for holding glasses or wine, or cups of coffee. You may have noticed my black and white floor. 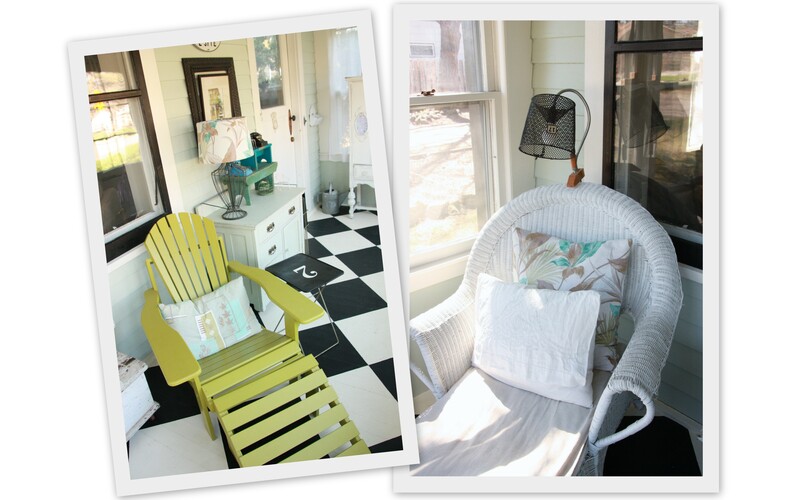 I painted this myself, and in fact this is my second version of a checkerboard floor on the porch. The first time I painted it in shades of green. 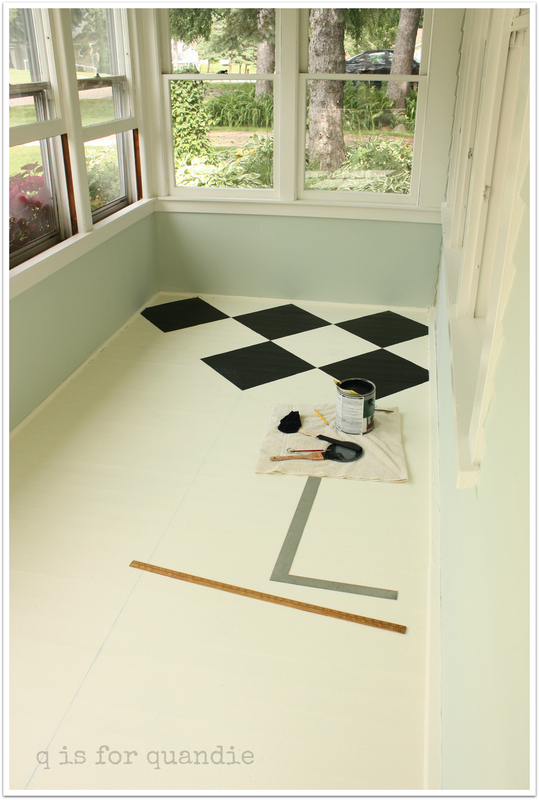 My process was to just paint the entire floor white, then draw the lines for the squares using a yard stick, a square and a pencil. You can see I ran a chalk line down the center to help keep them straight. Then I just painted in the black squares by hand. I have a pretty steady hand. It would have driven me nuts to tape all of those squares. I know I broke some rules by not centering the squares from one side wall to the other, but oh well, sometimes I’m a rule breaker. 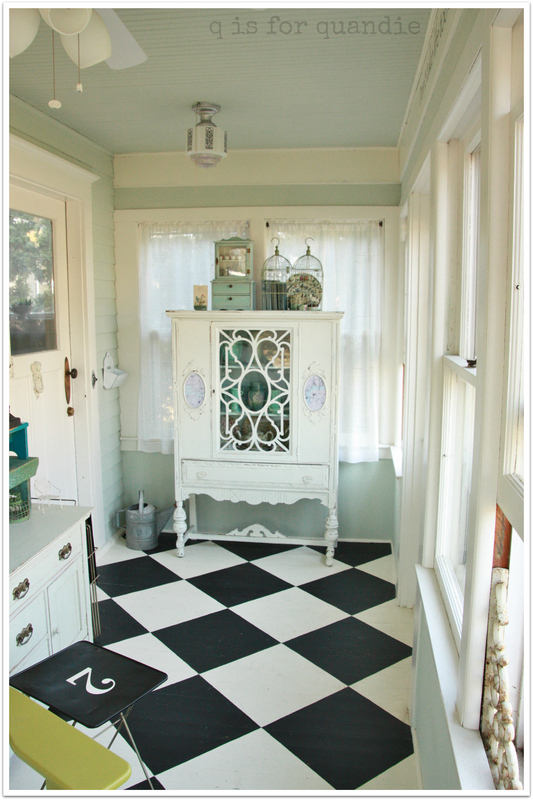 I am really fond of this floor, although sometimes I wish I had gone for a more subtle combination of grey and white. I might try that on another floor somewhere … who knows. And I almost missed sharing one of my favorite things on the porch! The quote above the front windows. A good reminder for those lazy summer evenings spent drinking wine and reading a good book. Love the floor if I ever get around to working in my house instead of a client’s I have toyed with doing that in my master bath. The cabinet with ovals is very sweet it will be fun to see how you tweak it. 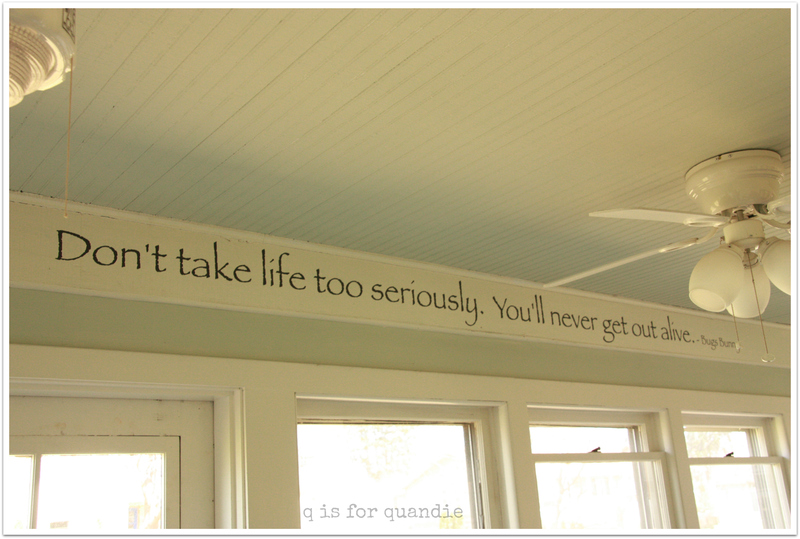 However my favorite is the saying on the wall! Personality just bubbles up in your home. I find that enchanting. I think the classic black & white checkerboard floor will always remind me of Charles & Diana’s wedding and that floor in St. Paul’s cathedral. It’s just a classic! Would be fab in a bath for sure! Thanks so much for the compliment, made my day! Love it! The wall/ceiling color is so serene and I like the contrast with the black & white floor. That light fixture is perfect too! Such great inspiration in every room of yours. I was doing some furniture rearranging and eyeing the 1927 dresser on CL, and then looked last night and it was gone! Glad it found a good home! I love that Union Jack dresser if only my son had a larger room. Awww, yep, the 1927 dresser sold last night! I’m working on some fun new pieces, so stay tuned. I love your blog, but knowing you and knowing your sense of humor, I most especially loved the sentence “I may consume a fair amount of wine out here too.”. It actually made me spit out my morning Diet Pepsi. LOL Keep up the good work! Love Love love! You and I are two peas in a pod, I declare! Look forward to your blogs like a morning paper! Thanks Cheryl! Have a cup of coffee for me while you are reading! 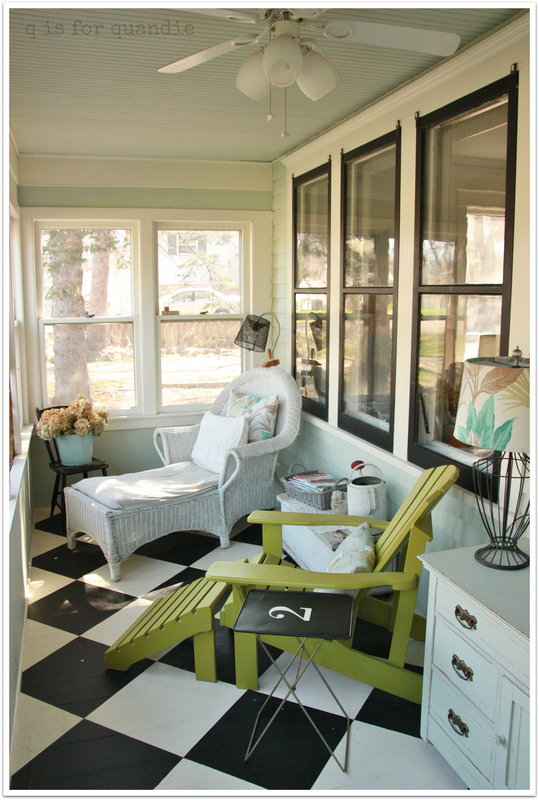 Love the whole porch and the green chair! I originally painted that green chair to go outside. I love how that chartreuse green works with the gardens. But it’s workin’ pretty good inside too! I also love sitting on that porch and so does Lucy! The wicker chair is very comfortable too. We’ll spend some more time out there when you visit in August! So nice, what a pretty place to unwind after a long day! Is that Haeger pottery I see in the cabinet? Yep, I believe it is. There is a McCoy or two in there as well. A woman after my own heart on both pottery counts! I snatched up a wonderful piece of Haeger at a garage sale a few weeks ago for 50 cents, they had no idea what they had! 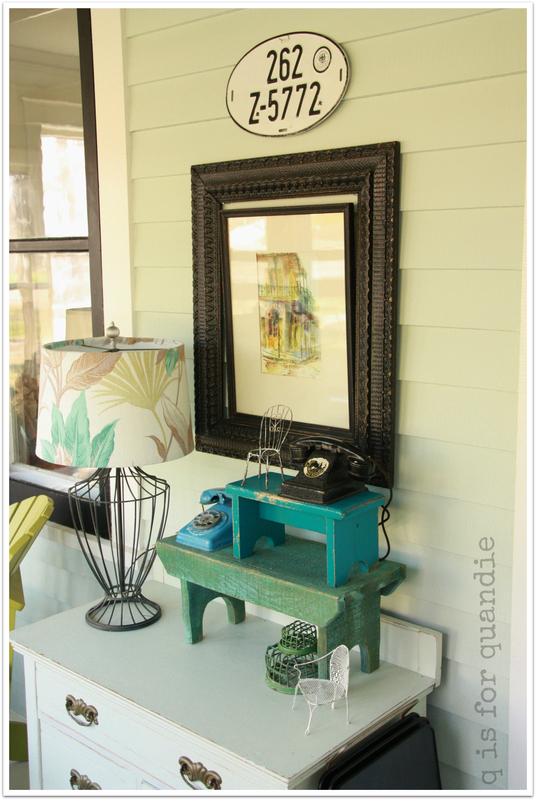 Ahhh that light fixture is so fabulous!!! I don’t even think I could be at the same garage sales as you because we’d be clawing for the same things! I had a porch at my last house in Mpls and I really miss it. I have a deck now, but there’s just something about a porch, so serene. Now I have to paint my metal trays too! As for the cabinet insets, some ticking strips would be cool. Maybe the same color as the inside? Looks like a fab place for wine and a book! I am seriously in love with your floors… thanks so much for sharing.